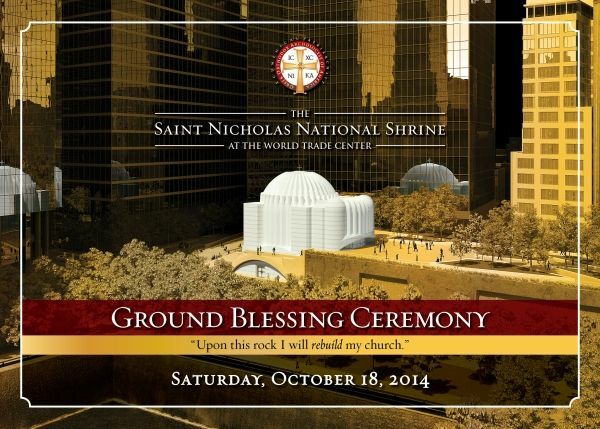 The Ground Blessing ceremony for the Saint Nicholas National Shrine at the World Trade Center, slated to be celebrated on Saturday, October 18, 2014. The Ground Blessing ceremony for the Saint Nicholas National Shrine at the World Trade Center, slated to be celebrated on Saturday, October 18, 2014 at 12:00 noon, will be broadcast domestically and internationally live via satellite feed, antenna satellite TV network, and Internet simulcast on the special internet page athttp://www.stnicholaswtc.org. The site is also accessible through the Greek Orthodox Archdiocese’s official web site http://www.goarch.org. The broadcasts will begin at 11:45 a.m. and conclude at 1:15 p.m. Established in 1916, the small Greek Orthodox Church of Saint Nicholas was the only house of worship destroyed on September 11, 2001, when the South Tower fell and completely obliterated the old church edifice. The new Saint Nicholas National Shrine will be rebuilt only a short distance away from its original location, at 130 Liberty Street, and will overlook the 9/11 Memorial.